Jacob Padrón and Becca Wolff have announced the formation of Tilted Field Productions, their new production company that creates and develops unique story-based projects in theatre, film, television, and new media. Unlike most production companies, Tilted Field is ensemble-based, and all members are graduates of Yale School of Drama. Along with Padrón, who is currently an associate producer at the Tony Award-winning Oregon Shakespeare Festival, and Wolff, a director and writer who recently completed the teleplay for a pilot with David Milch (creator of Deadwood and NYPD Blue), they are Dorothy Fortenberry (playwright), Teresa Avia Lim (actor), Michael Locher (designer), and Roberta Pereira (creative producer). Padrón and Wolff met while grad students at Yale in 2007. Both from Northern California (Gilroy and Watsonville, respectively), an instant rapport developed between them. Together, along with Erik Pearson, they ran the 40th anniversary season of Yale Cabaret, the legendary basement theatre which is a theatrical laboratory for the passion projects of Yale Drama School students. In 2008, Yale Cabaret was named Best Local Theatre by the New Haven Advocate. Following their success there, Jacob and Becca committed to forming their own production company where everyone involved would be counted on as an artist as well an administrator and producer; theatre artists would be encouraged to work outside their comfort zones, even in other media, in service of telling their stories. The ensemble will bring Tilted Field new ideas, help develop projects, spearhead their own projects, and provide guidance, inspiration, and support on the projects the company produces. Over the next 12 months, Tilted Field will develop and produce three new properties: a visual adaptation of a novel by a celebrated Mexican author, a sketch comedy web series culled from 500 hours of recorded improvisation, and the company’s inaugural project will be Tilted Shakespeare – to honor their theatrical roots – a 100% tilted interpretation of a classic Shakespeare tale. Tilted Field Productions hosted an official launch party on Sunday, August 22 at Umami Burger in Hollywood, which was attended by over 100 friends, family, and fellow artists from across the country. 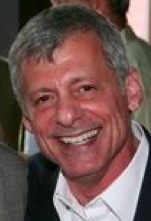 For complete biographical information on Jacob Padrón, Becca Wolff, and/or the ensemble members of Tilted Field Productions, visit www.tiltedfield.com. PLEASE CLICK HERE OR CALL (323) 845-9781. Hollywood’s Blank Theatre Company (Daniel Henning, Founding Artistic Director, Noah Wyle, Artistic Producer) has announced its 20th Anniversary Season, which will feature plays by Edmund White, David Sedaris, and Marc Blitzstein, plus 12 new plays by inspired teenagers. The Hollywood theatre company begins its 20th Anniversary season on October 2, with the Southern California premiere of Terre Haute by Edmund White, directed by Kirsten Sanderson. It will be followed by the return of The Blank’s new holiday tradition The Santaland Diaries by David Sedaris, starring Nicholas Brendon, directed by Michael Matthews, with performances beginning on November 19. Last season, Santaland sold out its entire run at The Blank’s 2nd Stage Theatre, and this year will be presented at the larger Stella Adler Theatre to accommodate audience demand. In celebration of its 20-year history, The Blank will then revive a production from 1994: the L.A. Weekly Award-winning Musical of the Year The Cradle Will Rock by Marc Blitzstein. This production also won three Drama-Logue Awards and received two Ovation Award nominations (Best Musical, Best Director of a Musical). This new production will be directed once again by Daniel Henning, and will start performances on February 5 , 2011. A complete recording of the score was released by The Blank in 1995; that recording will be re-released in celebration of this new production and The Blank’s 20th Anniversary. An exciting new American play will be announced later as the fourth production (which will take place in spring, 2011). The season will conclude with The Blank’s 19th Annual Nationwide Young Playwrights Festival, June 2-26, 2011. This season’s shows will be presented at two different Hollywood venues: The Blank’s 2nd Stage Theatre, 6500 Santa Monica Boulevard (on Theatre Row), and the Stella Adler Theatre, 6773 Hollywood Boulevard (at Highland). Full descriptions of the main stage plays follow. Between October 2010 and June 2011, The Blank will introduce Los Angeles audiences to over 50 new plays through its various programming. Since 1990, The Blank has presented 42 mainstage productions, over 420 fully staged workshops of new plays (in its Living Room Series), and 208 plays by teenaged writers in its Annual Nationwide Young Playwrights Festival. Nearly all of this work has been produced in Hollywood. The Blank Theatre Company’s productions have garnered rave reviews, audience acclaim, and numerous theatrical honors. Over the years, The Blank has been nominated for 23 Ovation Awards and won 5, including Best Musical, has received 15 L.A. Drama Critics Circle Award nominations and won 13 including Outstanding Production, and The Blank has received 24 L.A. Weekly Award nominations, winning 7 including Musical of the Year. Also, the company’s work has been nominated for 12 NAACP Theatre Awards, winning 4 including Best Production, and The Blank’s work over the last 20 years has won 17 Back Stage Garland Awards. The Blank was awarded the Hollywood Arts Council’s coveted Charlie Award for “pursuing artistic excellence, nurturing the next generation of playwrights, and challenging itself with a grand vision.” The Drama League designated The Blank as one of the Best Regional Theatre companies in America. Tickets are now on sale for Terre Haute. Tickets for The Santaland Diaries will begin October 8 and a rapid sellout is anticipated. For more information and to purchase tickets, visit www.TheBlank.com or call (323) 661-9827. Did you know that Timothy McVeigh and Gore Vidal were pen pals? What would their conversations have been like if they had ever met in person? Famed fiction writer Edmund White has imagined just that: four prison house conversations between the nation’s deadliest domestic terrorist and one of the world’s most famous and opinionated gadflies. The names have been changed, the ideas have not. This intimate and fascinating portrait of two men, both firebrands who say and do as they believe, delves deeply into the idea of what it means to be American and what one believes they must do for their country. Nicholas Brendon (Criminal Minds, Buffy the Vampire Slayer) brings his critically-acclaimed performance of The Santaland Diaries back to The Blank this holiday season. Santaland is an outrageously funny solo play (by NPR’s David Sedaris) about the author’s experiences as an unemployed writer taking a job as an elf at Macy’s Department Store. At first the job is simply humiliating, but once the thousands of visitors start pouring through Santa’s workshop, he becomes battle weary and bitter, occasionally taking out his frustrations on the children and parents alike. For those who like a little spice with their Christmas sugar, this tale of mass marketing, stressed out sales clerks, drunk Santas, screaming kids and the general insanity of the holidays is hilarious, witty, sardonic and unpredictable; mercilessly cutting through the Christmas spirit to point out what crazy things we do as human beings during the holidays. Corporations and churches use their influence to shape laws to their favor, unemployment hits new heights, and millions of Americans are losing their homes. Sound like the new millennium? In 1937, Mark Blitzstein’s musical called these issues into question with his scathing satire of greed, corruption and politics in the U.S.A. So scandalous, in fact, was The Cradle that the U.S. Government tried to shut it down. But Blitzstein’s humor, music and agitprop parody ruled the day and the public got to hear this terrific, fun, jazzy score. Snappy tunes, wonderful characters and deep questions about our nation will take you on a rollercoaster ride through the American patriotic psyche. The Blank will present an exciting new American play, to be announced later. If we didn’t tell you the plays were by teenagers, you wouldn’t know. The 12 best plays in the nation are chosen by a panel of theatre professionals from submissions by teenage playwrights. Winning writers are next assigned a mentor and then a professional director who guide their scripts to the stage. We then cast the plays with some of Hollywood’s hottest award-winning actors and present the work in a month-long festival. You have to see it to believe it! Left to Right Productions has announced the world premiere of Water, written and directed by Marios Stilianakis, at the Lounge Theatre in Hollywood on Friday, September 10, 2010 at 8pm. There will be one preview performance on Thursday, September 9. Water will play a strictly limited engagement through Sunday, October 17. In modern day Iraq, two soldiers, an American and an Iraqi, find themselves in adjacent cells in a Baghdad prison. Alone and confused about how they got there, they explore their situation, share their stories, and learn about one another and what led them to this place in their lives. While their co-existence is far from simple, and while they find themselves relying on each other for survival, they begin to realize that they have a lot more in common than what their separate worlds have led them to believe. Playwright/director Marios Stilianakis is a writer of fiction (Greek Matter, The Undefined Cluster of Happiness), screenplays (short live action films Good Morning Aphrodite, Agatha, and Back in 10, which he also directed), and stage plays. He also scripted a series for television (The Students). He has studied at Clark University, City University of London, Harvard University, and UCLA. Stilianakis divides his time between Los Angeles and New York City. 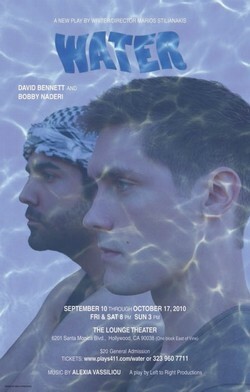 The cast of Water will feature (in alphabetical order) David Bennett and Bobby Naderi. The design team includes David Offner (set), Joe Morrissey (lighting and sound), Alexia Vassiliou (original music and voice), and Monika Hummer (costumes). Casting is by Kevin Shaw. Valerie Salas is the production stage manager, and Water is being produced for Left to Right by Zeke Rettman, along with executive producers Augusto Guerra and John Hodder and associate producers Constantinos Isaias and Corbin Frost. There will be one lower-priced ($15) preview performance of Water on Thursday, September 9 at 8pm, and opening night is set for Friday, September 10 at 8:00. The playing schedule is Friday and Saturday at 8pm and Sunday at 3pm through Sunday, October. 17. THE MEDIA IS INVITED AND ENCOURAGED TO ATTEND THE OPENING NIGHT PERFORMANCE ON FRIDAY 9/10, BUT IS ALSO WELCOME AT ANY OTHER PERFORMANCE AFTER THAT DATE. Tickets for regular performances (beginning September 10) are $20 and are available now by visiting www.plays411.com/water or calling (323) 960-7711. A portion of proceeds will be donated to the Red Cross Fund for Victims of War. The Lounge Theatre is located at 6201 Santa Monica Boulevard (one block east of Vine), in Hollywood.